Jazz Bashara lives in Artemis, the first city on the moon, which is populated mostly with rich tourists and eccentric billionaires. But any city also needs its maintenance employees, and even smugglers, which is where Jazz comes in. Her job as a porter barely covers her rent, so procuring harmless bits of contraband helps her to pay the bills. When an opportunity to make some real cash comes up, Jazz can't turn it down, and becomes embroiled in a conspiracy for control of Artemis itself. She has to use her brilliant mind and technical know-how to get herself, and her city, out of hot water. 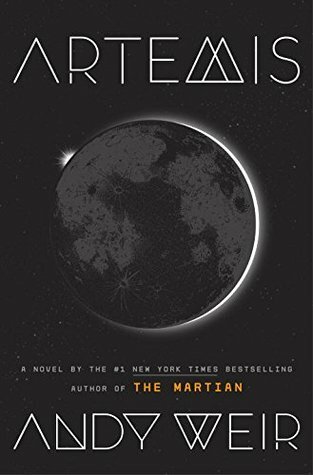 Author of the successful book, The Martian, this is Weir's second book, another sci-fi thriller with a light heart and a clever main character. Weir plays to his strengths, which include providing fascinating tidbits about what life would be like in space and in this case, what it would be like to live on the Moon. Just as you're getting pulled into what's happening with the characters, someone jumps out of a second story window without getting more than a few scrapes and you remember all of this is happening on THE MOON. It's just incredibly fun stuff. While not quite as strong as The Martian, this book is 100% fun and is recommended for fans of his first book or authors like John Scalzi. I was so excited to pick up a new book by Andy Weir! I loved The Martian, and Artemis didn’t disappointed. I agree that it wasn’t quite as strong as The Martian. There were some circumstances that felt off. For example, Artemis is a 100% oxygen environment, but a 100% oxygen environment is a bad idea (e.g. Apollo 1). That being said, I still really enjoyed the story. I love Weir’s wit and humor, and the idea that Jazz is smart enough to do (and excel) at anything, but instead chooses to be a smuggler and live by her own rules. It’s interesting, fun, suspenseful, and I could easily recommend it to those looking for a good sci-fi read.